The Government of Alberta has earmarked $350,000 to create guidelines for the cleanup of properties contaminated with traces of the powerful opioid fentanyl. Alberta Health posted a request for proposals (RFP) for a contractor to create guidelines that would be used by companies to comprehensively, and safely, clean homes that have been turned into drug labs, or buildings where opioids have been stored, as well as where the drug was known to be consumed. Proposals for the development of the fentanyl cleanup guidelines, which would be the first of their kind in Canada, closed September 5. While guidelines exist for cleaning up cannabis grow operations or methamphetamine-contaminated properties, Alberta Health officials indicated that opioid cleanups present their own unique challenges and safety concerns, primarily due the dust-like size and nature of fentanyl, and its routinely fatal potency. Although numbers are down significantly over 2017, Alberta Health still indicates that 355 people died from an apparent accidental opioid overdose in 2018. According to Health Canada, between January and March 2018, there were at least 1,036 apparent opioid-related deaths of which 94% were accidental. Fentanyl or fentanyl analogues were involved in 73% of those 2018 deaths, compared to 54% in 2016 and 72% in 2017. 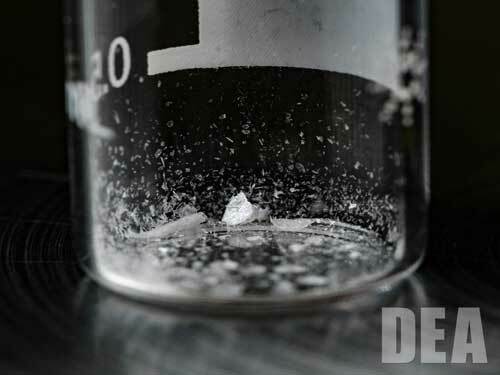 Agencies tasked with cleaning fentanyl sites must often use personal protection gear and specialized equipment such as ion mobility spectrometry to detect nanogram levels of the drug and its counterparts, such as carfentanil, which is some 100 times stronger, and fatal at doses as small as two grains of salt. Some cleanup agencies also use encapsulating solutions to trap and remove any detected substance. Between 2016 – 2017 the Government of Alberta spent $26.5 million on measures to address the opioid crisis. It distributed almost 15,000 naloxone kits from over 1,000 locations to Albertans for emergency treatment in the event of an overdose. The province also expanded opioid dependency treatment; expedited exemption applications to provide supervised consumption services in Edmonton and Calgary; and rolled out short-term public education campaigns. Beginning August 2017 primary care physicians caring for patients with opioid dependency gained access to expert consultation with an opioid dependency physician specialist over the phone. Does someone have guidelines? I’ve gotten calls from police chiefs wanting us to be on standby to clean their vehicles.